Do low-Ti basalts require a subcontinental lithospheric mantle source? Postulate: low-Ti basalts = subcontinental lithospheric mantle source. In their recent contribution on Karoo, Jourdan et al. (2007) write that subcontinental lithospheric mantle (SCLM) is required for origin of the Karoo flood basalts. As proof of this they suggest negative high-field-strength element (HFSE) anomalies and a “wet” mantle source, shown by biotite in some intrusive rocks, amongst other evidence. A negative HFSE anomaly is a classic subduction fingerprint, however. A “wet” source is also a characteristic of a subduction environment, so, why do Jourdan et al. (2007) conclude that these two subduction signatures indicate SCLM? Attribution of subduction geochemical fingerprints to SCLM is a conventional interpretation that started in the 1980s (e.g., Hawkesworth et al., 1984). It is based on the logic that volcanism far away (say more than a few hundred kilometers) from convergent plate boundaries cannot be related to subduction and thus subduction-like geochemistry must be attributed to SCLM previously modified by paleosubduction. This interpretation is based on the outdated view of water transport into the mantle by subducting slabs. In the 1980s it was thought that all subduction-related water is released beneath volcanic arcs and none passes into the deeper mantle. It is known today that such a view is incorrect. Experimental discoveries of hydrous phases and evidence for high water content in nominally anhydrous minerals, together with numerical modeling, show that at high rates of subduction significant amounts of water can subduct as deep as the transition zone and probably deeper (e.g., Litasov & Ohtani, 2003; Smyth et al., 2006; Komabayashi, 2006; Arcay et al., 2007; see also the AGU monograph Earth’s deep water cycle). At ultracold subduction zones water can go into the deep mantle even as high-pressure ice (Bina & Navrotsy, 2000)! Modeling (Bina et al., 2001) and seismic observations (e.g., Song et al., 2004; Zhao et al., 2004) show that some subducting slabs can deflect to horizontal (stagnate by depth) and propagate in this way far (thousands of kilometers) beneath continents. Thus, there is a physical and natural explanation for volcanism in the inner parts of continents, in particular in back-arc tectonic settings in relation to active (at the time of volcanism) subduction. Consider the paleotectonic setting of the Karoo flood basalt province (Figure 1). The diameter of the province is about 2500 km. Its southern (in present day coordinates) end was about 1500 km from an active subduction trench in the Jurassic. Considering prolonged Pantalassa (paleoPacific) subduction beneath this part of Gondwana we can assume that the mantle transition zone was full of slabs and therefore highly hydrated (see paleotectonic reconstructions: Early Carboniferous – Late Carboniferous – Late Permian – Early Triassic – Jurassic). Figure 1. Paleotectonic reconstruction of Gondwana in Early Jurassic time (from www.scotese.com). The location of the Karoo flood basalt province is added. 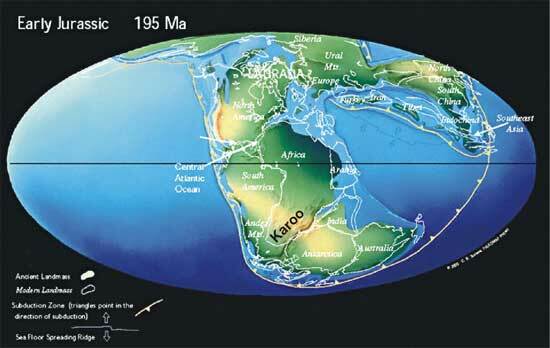 It is located in area beneath which prolonged subduction occurred (starting in the Carboniferous). Subducting slabs probably stagnated and were trapped in the mantle transition zone. Such slabs brought significant amounts of water and dehydrated with time. Dehydration led to volcanism similar in a sense to arc volcanism but induced by much deeper dehydration. Figure 2 shows experimental data on water stability fields of mineral phases within mantle peridotite and numerical calculations of slab buoyancy (from Ivanov et al., in press). This figure shows that fast (cold) subducting slabs can bring significant amounts of water into the deep mantle and that such slabs tend to stagnate in the transition zone. With time such slabs heat up to ambient mantle temperature and dehydrate. Released water induces melting. If the released water is not enough to induce melting because it is dissolved in olivine (up to 0.9 wt.% of H2O can be dissolved in olivine at the depth of the lowermost upper mantle) it will lead to the volumetric expansion of olivine (Smyth et al., 2006) and rise of peridotitic diapirs (Ivanov et al., in press). Such diapirs cross their solidus at ~ 250 km depth (Figure 2). Low-Ti basalts with subduction trace-element signatures in back-arc tectonic settings are likely indicators of such process (Ivanov & Balyshev, 2005; Ivanov, 2007; Ivanov et al., in press). Figure 2. Saturation of the transition zone with water via subduction and possible regions of melting of water-saturated, advected mantle peridotite (after Ivanov et al. in press). Left: a fast subducting slab attains positive buoyancy while crossing 410 km discontinuity. Both fast- and slow-subducting slabs attain positive buoyancy while crossing 660 km discontinuity (after Bina et al., 2001). Right: stability fields (shadowed) of water-bearing minerals in the CaO-MgO-Al2O3-SiO2-H2O (CMAS+H2O) system (after Litasov & Ohtani, 2003). Water-bearing minerals: Wd – wadsleyite, Rw – ringwoodite, E – dense hydrous magnesian silicate, B and G/D/F – superhydrous phases. Straight lines show boundaries between different mineral assemblages (not included for the sake of simplicity). Curved dotted line shows limits of clinopyroxene stability field (cpx in and out). The symbol ‘Ol’ is located in the region of highest solubility (up to 0.9 wt. %) of H2O by olivine (Smyth et al., 2006). H2O solubility of olivine decreases with increasing temperature (Smyth et al., 2006). White ellipses mark possible depths of melting of water-saturated mantle peridotite advected from the transition zone. These regions are placed near or just above the solidus line in the CMAS + 2 wt. % H2O system marked by the hatch-dotted line (Litasov & Ohtani, 2003). The depths of the regions of melting correspond well to those suggested by Hirschman et al. (2005). At intermediate depth between the two regions of melting in the upper mantle is characterized by the highest water capacity that prevents melting (Hirschman et al., 2005). Now consider why the subduction environment is characterized by volcanic rocks with HFSE-negative anomaly. It is almost universally agreed that the source of melting beneath arcs (above subducting slabs) is hydrated MORB mantle referred to as mantle wedge (e.g., Ulmer, 2001). Previously dry MORB-type mantle is hydrated by water fluids derived from a subducting slab. Water transports light ion lithophile elements (LILE), but does not transport HFSE. Melting of such source enriched by LILE yields melts enriched by LILE but not enriched by HFSE. So, it is not HFSE-depletion, but LILE enrichment that is responsible for the HFSE-depletion anomaly. Does the depth of dehydration affect the magnitude of the HFSE-depletion anomaly? Yes, because the activity of H2O is dependent on temperature (Komabayashi, 2006) and deeper dehydration occurs at higher temperatures. For deep dehydration (400-600 km) water fluid will transport more HFSE compared to shallow (~100-150 km) dehydration. Thus, we should expect that magmatism related to deep dehydration will be similar to island-arc magmatism, but with less prominent subduction signatures (e.g., a smaller HFSE-anomaly). The Taos plateau in the northern part of the Rio Grande rift (western US), which is the youngest (about 4 Ma) flood basalt province on Earth with low-Ti basalts, also referred to as high alumina olivine tholeiites (HAOT), is about 1500 km away from a present-day convergent boundary. Leat et al. (1988) suggested that prominent HFSE depletion in similar basalts from the Rio Grande rift is due to melting of asthenosphere metasomatised by subduction-derived fluids above the Farallon slab. Later Gibson et al. (1993) argued that the source of these rocks was within the lithosphere of a Proterozoic island-arc terrain. Recently, the wide distribution of HAOTs in the western US were interpreted with reference to a low-velocity zone (LVZ) on top of the Farallon slab (Song et al., 2004). This LVZ is probably a fluid-induced melting zone (Song et al., 2004). The Siberian Traps, which is the most voluminous and probably the largest continental flood basalt province (initiated in the latest Permian, but volcanism continued up to the Middle Triassic; see Ivanov, 2007 for a review), was situated in the back-arc setting of the Mongolia-Okhotsk and Paleo-Tethis oceans (see Figure 5 in Ivanov, 2007 based on a Late Perman paleotectonic reconstruction). The southern (in present-day coordinates) part of the Siberian Traps was about 700-800 km from the Mongolia-Okhotsk trench. Trace-element compositions of the most Mg-rich samples (the so-called low-Ti – 2 series) from shallow sills practically overlap those of initial melts of the Kamchatka arc (Figure 3), suggesting a similar origin, i.e., melting of hydrated mantle). Subduction signatures decrease with increasing distance from the Mongolia-Okhotsk trench suggesting a link with active (at time of magmatism) subduction. Figure 3. Comparison of the high-Mg-number dolerite sample 887 of the low-Ti - 2 series with the parental melt compositions of six different volcanoes, including Klyuchevskoi volcano, along the frontal arc of Kamchatka (100-180 km above the subducting slab) (modified after Ivanov et al., in press). Other high Mg-number samples of the Angara-Taseevskaya sills show the same trace-element spectra and arenot plotted for the sake of simplicity. Data for parental melts of Kamchatka are plotted after Portnyagin et al. (2007). The average of high Mg-number basalts of Klyuchevskoi volcano (Dorendorf et al., 2000) is also plotted to show that parental and crystallized melts exhibit the same trace-element patterns. Rb, Ta, Pb were not analyzed by Portnyagin et al. (2007) and are thus excluded from the diagram. A HAOT sample from California (after Grove et al., 2005) is plotted to show that HAOT and low-Ti basalts are geochemical analogues. Western US, Karoo, the Siberian Traps and other (e.g., Emeishan, Columbia River Basalts) Late Paleozoic to Cenozoic provinces with abundant low-Ti basalts should be revisited to test whether their origins can be explained by associations with subduction systems or if SCLM is indeed required as commonly postulated. The true origin of volcanic provinces with low-Ti basalts cannot be understood until a multiple-working-hypothesis approach is used. The postulate that low-Ti basalts are derived from SCLM is based on the outdated assumption that subduction geochemical features far from active subduction can only be due to paleosubduction. Cold subduction can bring significant amounts of water into the transition zone. Consequent dehydration of the transition zone is a possible explanation for subduction geochemical signatures in volcanics beneath inner continental regions. Arcay, D., Doin, M.-P., Tric, E., Bousquet, R., 2007. Influence of postcollisional stage on subduction dynamics and the buried crust thermal state: insights from numerical simulations. Tectonophysics 441, 27-45. Bina, C.R., Navrotsy, A., 2000. Possible presence of high-pressure ice in cold subducting slabs. Nature 408, 844-847. Bina, C.R., Stein, S., Marton, F.C., Van Ark, E.M., 2001. Implications for slab mineralogy for subduction dynamics. Phys. Earth Planet. Int. 127, 51-66. Dorendorf, F., Wiechert, U., Wörner, G., 2000. Hydrated sub-arc mantle: a source for the Klyuchevskoy volcano, Kamchatka/Russia. Earth Planet. Sci. Lett. 175, 69-86. Gibson, S.A., Thompson, R.N., Leat, P.T., Morrison, M.A., Hendry, G.L., Dickin, P., Mitchell, J.G., 1993. Ultrapotassic magmas along the flanks of the Oligo-Miocene Rio Grande rift, USA: monitors of the zone of lithospheric mantle extension and thinning beneath a continental rift. J. Petrol. 34, 187-228. Grove, T.L., Baker, M.B., Price, R.C., Parman, S.W., Elkins-Tanton, L.T., Chatterjee, N., Müntener, O., 2005. Magnesian andesite and dacite lavas from Mt. Shasta , northern California: Products of fractional crystallization of H2O rich mantle melts. Contrib. Mineral. Petrol. 148, 542-565. Hawkesworth, C.J., Marsh, J.S., Duncan, A.R., Erlank, A.J., Norry, M.J., 1984. The role of continental lithosphere in the generation of the Karoo volcanic rocks: evidence from combined Nd- and Sr-isotope studies. In: Petrogenesis of the volcanic rocks of the Karoo province.(ed.) Erlank, A.J. (Special Publication of the Geological Society of South Africa 13), p. 341-354. Ivanov, A.V., 2007, Evaluation of different models for the origin of the Siberian Traps. In: The origin of melting anomalies: Plates, plumes and planetary processes; (eds) Foulger G.R. and Jurdy D.M., Geological Society of America Special Paper, p. 669-692. Ivanov, A.V., Balyshev, S.V., 2005. Mass flux across the upper-lower mantle boundary. In: Plates, plumes and paradigms; (eds.) Foulger, G.R., Natland, J.H., Presnall, D.C., Anderson, D.L., Geological Society of America Special Paper 388, p. 327-346. Ivanov, A.V., Demonterova, E.I., Rasskazov, S.V., Yasnygina, T.A., in press. Low-Ti melts from the Southeastern Siberian Traps Large Igneous Province: Evidence for a water-rich mantle source? J. Earth System Sci. Komabayashi, T., 2006. Phase relations of hydrous peridotite: implications of water circulation in the Earth’s mantle. In: Earth’s deep water cycle; (eds.) Jacobsen, S.D., Van der Lee, S.,Geophysical monograph 168, p. 29-43. Leat, P.T., Thompson, R.N., Morrison, M.A., Hendry, M.A., Dickin, A.P., 1988. Compositionally diverse Miocene-Recent rift-related magmatism in Northwest Colorado: Partial melting and mixing of mafic magmas from 3 different asthenospheric and lithocpheric mantle sources. J. Petrol. Special Lithosphere Issue, 351-377. Litasov, K, Ohtani, E., 2003. Stability of various hydrous phases in CMAS pyrolite-H2O system up to 25 GPa. Phys. Chem. Minerals 30, 147-156. Portnyagin, M., Hoernle, K., Plechov, P., Mironov, N., Khubunaya, S., 2007. Constraints on mantle melting and composition and nature of slab components in volcanic arcs from volatiles (H2O, S, Cl, F) and trace elements in melt inclusions from the Kamchatka Arc. Earth Planet. Sci. Lett. 255, 53-69. Smyth, J.R., Frost, D.J., Nestola, F., Holl, C.M., Bromiley, G., 2006. Olivine hydration in the deep upper mantle: Effect of temperature and silica activity. Geophys. Res. Lett. 33, L15301. Song, T.-R.A., Helmberger, D.V., Grand, S.P., 2004. Low-velocity zone atop the 410-km seismic discontinuity in the northwestern United States. Nature 427, 530-533. Ulmer, P., 2001. Partial melting in the mantle wedge – the role of H2O in the genesis of mantle-derived ‘arc-related’ magmas. Phys. Earth. Planet. Interiors 127, 215-232. Zhao, D., 2004. Global tomographic images of mantle plumes and subducting slabs: insight into deep earth dynamics. Physics Earth Planet. Int. 146, 3–34.